The holiday apartment is located on the first floor. Located in front of both the bright studio with kitchen nook and the rustically kept living room bedroom with its wooden beams and parquet flooring are two balconies. The view of the 10 km distant sea and the seaside Alps enchants the visitor along with the quietness of the enclosed pool (8 x 4 m). Shops are just 100 m away on the marketplace. Further Details: The rental apartment consists of two living-/bedrooms. Ground floor is reserved for the family. A couple, living near the marketplace, is in charge of the rental. They are to be adressed for any kind of help needed. They speak english, german and french. The pool: The pool is 8 m x 4 m large and is exclusively for your use. It is not heated. Unfortunately french law obliges me to put a fence around the pool for security reasons. It does interfere a bit with the beauty of the house. It may not be taken down. Being driven out of the eastern part of Germany after the war and travelling around at large extent because of my father's profession, my parents bought the grounds in 1958 and started building a house after their own ideas. First it was just a vacation villa, then my paernts lived there for 28 years after my father retired. It is only after them moving away that I started to fix the upper level for vacation rentals. Now my family is using the ground floor on their own and housekeepers are caring for the house, the pool and our guests. Bedlinnes is provided weekly and included in the rentalfee. Towels are provided weekly and are included in the rental fee. Please bring your own towels for the pool and the beach! The WiFi-code will be given to you at arrival. Small, but takes dishes for 5 people. situated in the element: cooking-baking-dishwashing. A large fridge with plenty of room for storing drinks in the summer. Small, but sufficient. Only 1 inlet. The nook kitchen is fully equipped. It is situated in the room with the double bed. In the larger of the 2 rooms you find a large table with 6 chairs. TV programmes shown in french, english, italian. Just a small portable Radio-cd-player. Lots of books available in english, german and french. Old ones and modern ones. You make take home one of my books and leave one of yours... if you like. some games, pencils. No water toys. 1600 sqm large. Old olivetrees. you may also sit in the garden. 3 balconies: 2 towards the south (vue of the sea) and one overlooking the pool. The pool is secluded for children's safety. The apartment consists of 2 living/bed-rooms. In the 'studio', the smaller of the two connected rooms you will find a French double bed (160 cmx200 cm), 2 comfortable chairs with table and a separate kitchenette with dishwasher, big refrigerator, stove with oven, microwave, hot-water-cooker, coffee machine. On the balcony facing to the south up to 5 persons can be seated at the table. The balcony can be shaded. In the larger 'wooden room' you will find two separate beds (90 cm x 190 cm), a dining table with 8 chairs, the television and a CD-player/cassette-recorder/radio. Many books in English, German and French wait to be read. On the pool side, which is enclosed by a fence for your and your children's safety according to French law, long-chairs, chairs and tables and the barbecue are to your convenience. Our house caretakers are very glad to help, if you need some information. Pragtfuld bolig med god beliggenhed. Rent, pænt, god modtagelse og meget service minded udlejer. Kan varmt anbefales. Die Ferienwohnung ist sehr gut ausgestattet und angenehm ruhig gelegen. Vom Balkon, der über eine elektrische Markise verfügt, hat man einen tollen Blick über den Garten mit Olivenbäumen und kann sogar etwas vom Meer sehen. Der Pool wurde regelmäßig gereinigt und hatte eine einwandfreihe Wasserqualität. Die Verwalter der Immobilie, Eric und Michele, sprechen Deutsch. Sie waren täglich vor Ort, und haben sich schnell und äußerst freundlich um unsere Anliegen gekümmert sowie Tipps für Ausflüge gegeben. Die organisatorische Abwicklung lief völlig problemlos und war sehr korrekt. Fragen an die Vermieterin per e-Mail wurden schnell und entgegenkommend beantwortet. Leider hatte ein Stromausfalls im gesamten Dorf die Elektronik der Heizungsanlage beschädigt, so dass das warme Wasser, trotz intensiven Bemühungen um eine Reparatur, ein paar Tage ausfiel. Hierfür haben wir ungefragt anteilige Mietrückerstattung erhalten. Herausforderd war nur ein Engpaß an der Zuwegung, der auf beiden Seiten unseres Autos je nur ca. 10 cm Platz ließ. Dies erforderte eine sehr aufmerksame und vorsichtige Fahrweise. Super Urlaub mit allem was dazu gehört. Wir durften einen wundervollen Urlaub im Gilamour verbringen. Das Haus liegt am Ende einer ruhig gelegenen Straße und überzeugt durch seine Lage, Aussehen und das super Ambiente. Der Ort La Roquette bietet den Vorteil, dass er sehr ruhig gelegen ist doch Hotspots wie Cannes usw. in kürzester Zeit erreichbar sind. Die Ferienwohnung ist sehr gemütlich und es fehlt einem an nichts. Das Badezimmer wurde kurz vor unserer Ankunft neu gemacht, genauso wie der elektrische Sonnenschutz für den Balkon mit Meerblick. Die Objektbetreuer vor Ort (Eric und Michele) sind supernett und haben immer ein offenes Ohr und Tipp. Das Highlight für unseren Sohn war der Pool! Kurz und knapp gesagt, kann man einen Aufenthalt in diesem Objekt wirklich jedermann empfehlen!! Super idyllisch und dennoch logistisch perfekt gelegenes Feriendomizil zwischen Cannes und Grasse. Der Pool ist genial und die Wohnung mit Balkon samt Aussicht (inkl. Meer(fern)blick) auch für Familien absolut urlaubstauglich! Ausflüge auch in die fernere Umgebung (mit Auto) kein Problem! Kurzum: der ideale Ort, um im Süden Frankreichs Urlaub zu machen! Wir haben 2 sehr schöne Wochen in der Ferienwohnung verbracht. Der Empfang war sehr Herzlich sowie die gesamte Betreuung wärend unseres Aufethalts. Es wurde regelmäßig nach dem rechten gesehen, außerdem konnten wir uns bei Fragen jederzeit an das betreunde Ehepaar wenden. Die Ferienwohnung ist sehr sauber, gemütlich eingerichtet und super ausgestattet. Wir haben unsere Zeit dort sehr genossen und würden jederzeit gerne wieder kommen. Wir haben uns hier wie zu Hause gefühlt. Man fühlt überall , daß das Haus mit viel Liebe aufgebaut und erhalten worden ist. Die Betreuung vor Ort ist perfekt. 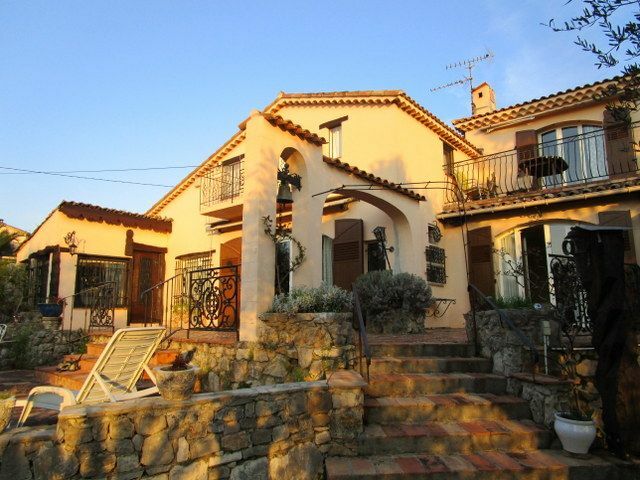 The village, located in the lovely hinterlands of Cannes, is the perfect starting point for trips to picturesque villages, chic towns and wild mountainous landscapes. No tourism in the village itself. Lovely peaceful pathways lead through woods of mimosa-trees to the old graveyard or to the shepherd's shed. Your daily needs can be fulfilled in the village itself: daily fresh baguette, Café, Bar, Post office, small supermarket, doctors, drugstore, hairdresser, beauty salon. In the neighbouring village Mouans Sartoux, at only 3.5 km away, you find banks, Restaurants, large supermarkets, tourist information, peasant markets. Starting in La Roquette you can take a bus to Cannes and Mouans Sartoux, where you find the railway station leading to the well-known cities like Grasse (perfumes), Cannes (film festival), Monaco (prince, racing track) and even to Italy. In just a few kilometres distance of your holiday rental you find tennis courts and greens. Museums and artists homes are to be visited in the little charming villages. Golf: In about 10-15 km distance you will find the Golf Country Club of Mougins (18 holes), Golf of Mandelieu (18and 9 holes), golf green Opio-Vabonne (18 holes). Ski: The skiing resort of Gréolières-les-neiges is only about 1 1/2 hours drive away. Why don't you ski in the morning and sit on the beach in the evening? An- und Abreisetage können nach Vereinbarung geändert werden.